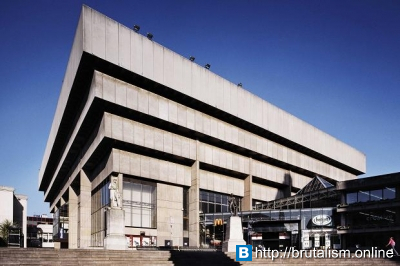 Birmingham Central Library was the main public library in Birmingham, England from 1974 until 2013. For a time the largest non-national library in Europe, it closed on 29 June 2013 and was replaced with the Library of Birmingham. The existing building was due to be demolished early in Summer 2015 after 41 years, as part of the redevelopment of Paradise Circus by Argent Group. 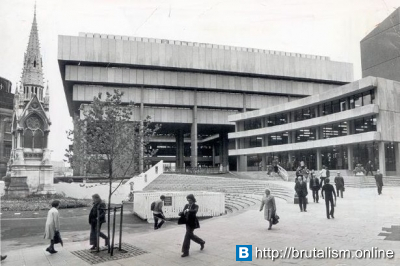 Designed by John Madin, the library was part of an ambitious development project by Birmingham City Council to create a civic centre on its new Inner Ring Road system; however due to economic reasons significant parts of the masterplan were not completed and quality was reduced on materials as an economic measure. Two previous libraries occupied the adjacent site before Madin’s library opened in 1974. The previous library was opened in 1883 and was designed by John Henry Chamberlain featuring a tall clerestoried reading room, this was demolished in 1974 after the new library had opened. Despite the original vision not being fully implemented the library has gained architectural praise as an icon of British Brutalism with its stark use of concrete, bold geometry, inverted ziggurat sculptural form and monumental scale. Its style was seen at the time as a symbol of social progressivism. 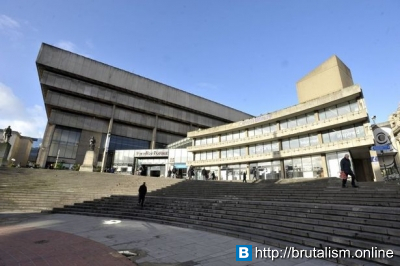 Birmingham City Council had long planned to move library services away from Central Library to leave the building free for redevelopment of Paradise Circus. The Paradise Circus site was sold by the Council in 1998 to Argent Group, which spelt an end to Central Library. In 2004 an initial plan to move to a Richard Rogers designed building in Eastside didn’t materialise. A site 150m west of the current building at Centenary Square was chosen in 2007 and subsequently the new Library of Birmingham was built and opened on 3 September 2013. In the intervening years Argent Group produced plans for the Paradise Circus site which did not intend to retain the library building. In response to potential demolition English Heritage applied on two occasions for the building to be listed. On both occasions the library was refused status as a listed building after lobbying from Birmingham City Council. In February 2011 the library received a 5-year Certificate of Immunity from Listing after an application from Birmingham City Council, which meant it could not be protected from demolition until 2016. The library closed on 29 June 2013 and books and archives were moved across to the Library of Birmingham. Planning Application 2012/05116/PA was approved by the City Council on 8 February 2013. The commercial outlets of Paradise Forum closed in January 2015 and the library site was fenced off except for the pedestrian route through the library linking Chamberlain and Centenary Squares. Internal demolition of the library took place in the Summer and Autumn of 2015. On 1 November 2015, Paradise Forum was closed to pedestrians and Chamberlain Square was fenced off for external demolition to take place. Visible external demolition to the main library building began on 6 November 2015. On 15 November 2015 the road tunnel beneath the library permanently closed to traffic for demolition to progress. On 14 December 2015 the first exterior concrete panels to the reference library were removed to mark the start of significant demolition. On 28 January 2016 the curved facade of the lending library began to be demolished. The glass roof of the internal atrium came down on 26 February 2016.